Affiliated with Cummings School of Veterinary Medicine at Tufts University, Tufts VETS (Veterinary Emergency Treatment & Specialties) is a specialty and emergency veterinary hospital located in Walpole, MA. 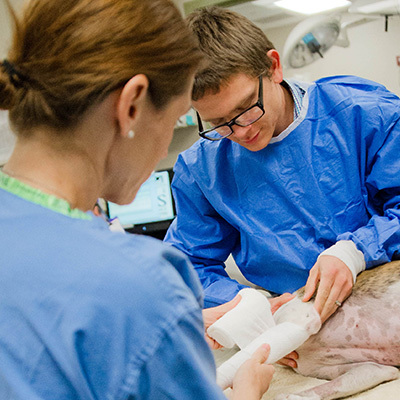 Current disciplines represented at Tufts VETS include emergency & critical care, ophthalmology, internal medicine, surgery, anesthesiology, radiology and ultrasonography. Our special and unique veterinary services attract pets and their families throughout New England and beyond. We work closely with your primary veterinarian in order to provide optimum care for your beloved pet. Your referring veterinarian knows your pet best and this enables them to provide the best primary care services available. By not performing wellness visits, Tufts VETS can focus solely on providing the best veterinary emergency and specialty care possible. When coming for a specialty consultation, please ensure that you bring all appropriate medical records from your referring veterinarian. Thanks for visiting—we look forward to serving you.